Maureen, Nancy, Terry, Andrea, and me! It seems that each year at Christmas, I’m amazed by something new about the boundary-breaching mystery of the Incarnation. Last year, I reflected much on the idea that Jesus gave God a human face. For centuries before Christ, our ancestors prayed to a God that they had read about in the scriptures but that remained an ethereal presence. Jesus came, and God could be touched and held! We have a deep sense of who our God is in Jesus – we can see actions, hear words, observe and imitate the radical love and compassion that he embodied. Jesus’ birth is God saying to God’s people: I love you, and I want you to know me. This year, praying with Emmanuel, I was touched by our God’s intimate knowing of the human heart. In taking flesh, Jesus lives in our world, breathes, eats, and sleeps. As a baby, he depends on his parents for sustenance and love. He lives times of great joy and great struggle. He loves, cries, laughs, and feels the whole gamut of human emotion. Now, God didn’t need to take on human form to understand us; God created us! But maybe this is a reminder for us when we need one: Jesus really understands it, all of it. It’s like God’s saying: I love you, and I want you to know that I know you. Sometimes, our life seems full of “thick places.” God may seem too distant, too big, too incomprehensible, too mysterious to be knowing and knowable. There are moments when I look up into the vast sky and wonder, “Who is this God, really?” A God who created all we see and who finds a way to speak to little me is tough to grasp at times. But Christmas reminds us in a powerful way that it is true. My spiritual director often begins prayers with, “God of the universe and God of our hearts…” God is mystery, yes, but God is oh-so-close, with, among, and in us. We’re always in a thin place. At the beginning of December, Andrea, Donna, and I went to Nerinx, Kentucky, to spend a few days at Cedars of Peace, a retreat center run by the Sisters of Loretto. We each had our own little hermitage for the weekend. I spent hours just sitting in the comfy chair in front of the large picture window, watching the squirrels and letting the silence seep into my bones. Winter has its own beauty, and it spoke to me of Advent. The tall, bare trees sing of being naked and vulnerable before God who knows us so deeply. There was a freedom in their leafless splendor, all of their branches stretching out, as if unabashedly reaching for God with every fiber of their being. There was nothing superfluous about them, just a simple be-ing. They invited me to simply be, too, making space for Jesus’ love and new life to grow. I felt God’s healing love in an undeniable way. There was that Incarnation insight that’s been with me: I know you and love you as you are. I prayed Maranatha, and I knew that Jesus was there. surprising sign of God's presence?! 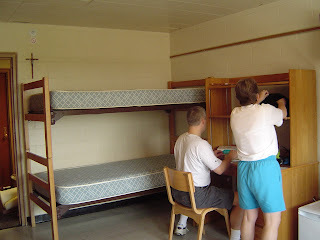 On the last morning of retreat, I had just finished cleaning my cabin and packing up. I had about ten minutes to spare until departure, so I plopped down in the big chair one last time, sad to be leaving and hoping I’d be able to carry with me the Presence I’d felt. I didn’t feel much like praying and certainly didn’t expect anything miraculous. 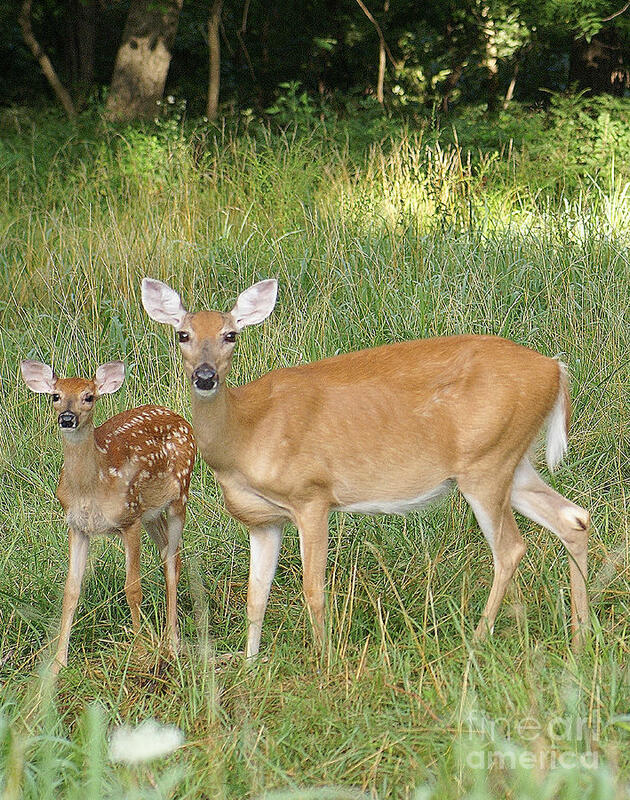 Well, right when I looked out the window, three deer that I had encountered throughout the weekend came bounding out of the woods and began playing. Right then! Andrea could see them from her cabin, too. I was overcome with prayer, the best kind, the kind that catches you off guard and reminds you that it is God who does the praying in us, anyway. It was a reassurance: I was with you here on retreat, but of course I’m with you always. How did you know I needed that? I thought. And I felt God’s intimate, knowing smile at me in the wonder of nature around me. A thin place. How will you be open to the “thin places” to come? I ask God’s grace for you and me, that we might be awakened to the Christmas-infused nature of our whole lives. 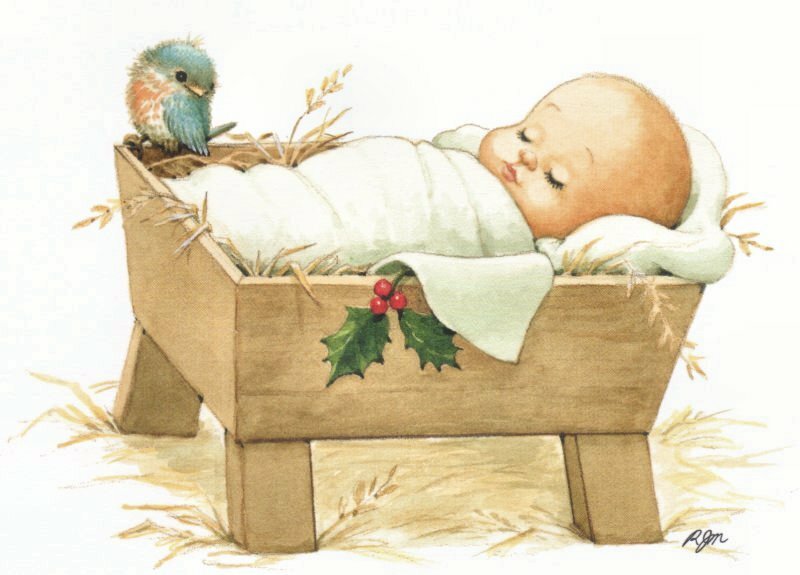 God’s powerful love, gentle comfort, and deep joy are born in us each day. God’s spirit of courage, justice, charity, and compassion urge us on like a fire within. Jesus touches our lives and invites us to touch the lives of others. It’s probably a good idea for all of us to eat less cream cheese and cookies in 2014. But let’s make sure from time to time to stand where we are, as we are, and behold how heaven is touching earth. God is near. Year after year, the place we are in is thin. If you had walked down the hall on the second floor of the otherwise quiet Sisters of Charity Motherhouse tonight, you would’ve heard female voices enthusiastically shouting these words and names, among others, interspersed with boisterous laughter. You might have asked yourself: What is this all this ruckus?! Who are these people? And why are they yelling out a random list of religiously-affiliated people and things...and then laughing?!? The only answer (obviously) is that it was a bunch of young nuns playing Charades! The women that gathered tonight are young Sisters and Sisters-in-training (and young-women-thinking-about-becoming-Sisters-in-training) from all over the Archdiocese of Cincinnati. There were 17 of us. This is the second time the group has met, and some people couldn’t make it due to the holiday weekend. 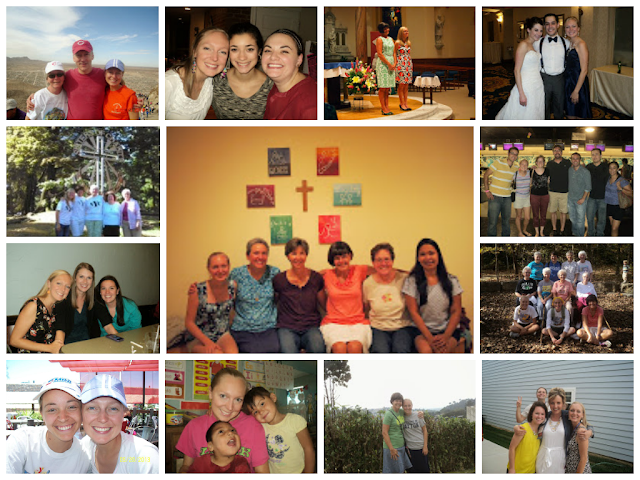 We came from 7 different congregations and ranged in age from early 20’s to 50.
Who says religious life is dying?! We started the evening with a “speed-dating” ice breaker to get to know each other better. (One of our Sisters joked, "It's been awhile since I've had a date." J) We took turns pairing up and responding to the question, “What attracted or attracts you to religious life?” The word "community" popped up all over the place. It seems that many of us were drawn by the chance to throw our lot in with people who have given themselves completely to the mystery that is God. We couldn't and wouldn't want to do this alone. At the very heart of the call to religious life is a desire to share life with other women whose lives are totally centered in Love and driven by the Gospel. We are women who want to pray together; who want to serve and minister to those most in need in our society together; who want to become the best, truest version of ourselves together; who want to work for justice and peace together. Being a part of the deep-rooted and far-reaching network of Sisters all over the city, country, and world is a life-force. I am energized and strengthened just knowing that there are so many others who have chosen and are choosing this path. Certainly, no nun is an island! In this season of gratitude, I've been especially thankful for the wider community of religious women. A few weeks ago, I found myself in New Orleans for "Nuns Build," a week for Sisters from many different parts of the U.S. to come to Louisiana and do restoration work on homes destroyed by Katrina. 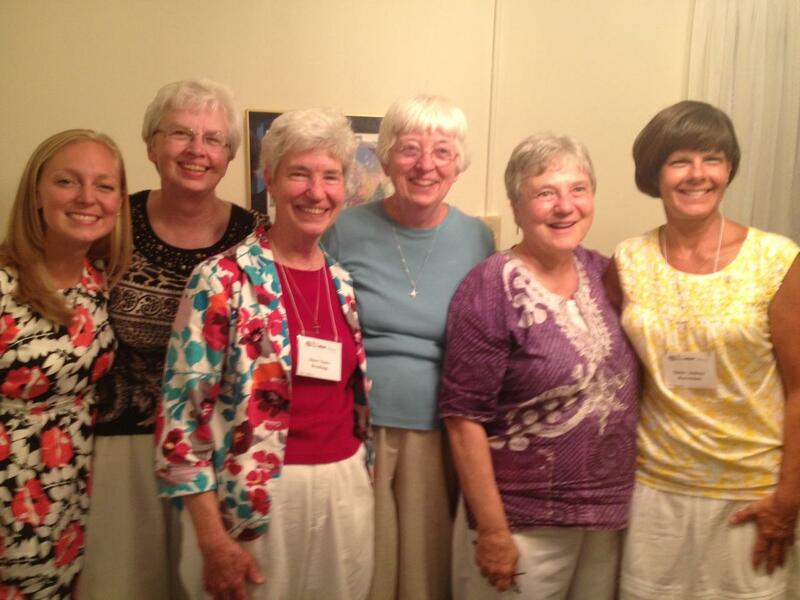 About eighty Sisters came for Nuns Build, some of them taking vacation to be there. Nine of us from the Sisters of Charity of Cincinnati participated, including Sister Monica who lives New Orleans and co-chaired the entire Nuns Build program. 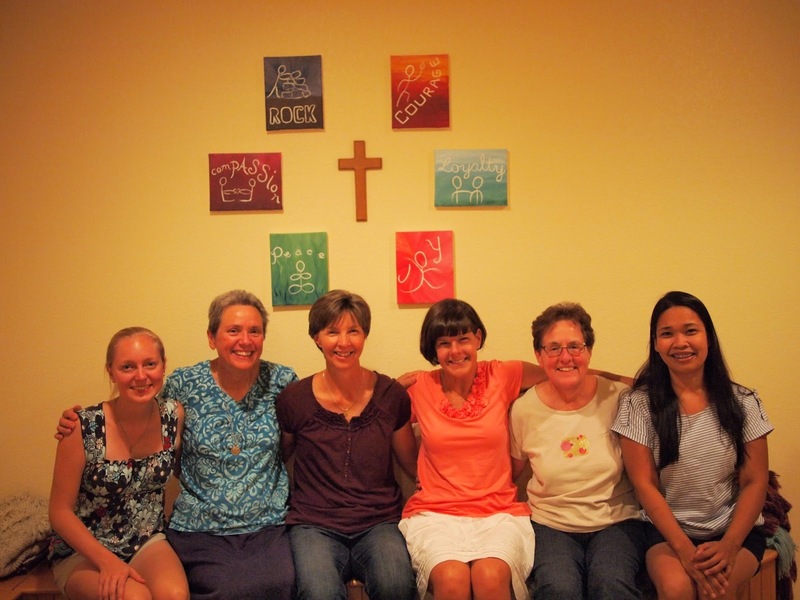 We stayed with 11 other Sisters of Charity from different congregations at the House of Charity where Monica resides and hosts volunteer groups throughout the year. In New Orleans, there are 8,000 families still awaiting to return home since Katrina happened in 2005. They simply cannot afford to rebuild their houses. Organizations like the St. Bernard Project that we worked with are striving to help people get back into their homes. They have 130 families on the waiting list and 15 new applications each day. Resilient and strong but hurting, the people of New Orleans still need much support. The Sisters of Charity (SC) group was assigned to work on a house belonging to a man name Raymond. Katrina destroyed his home, and in the eight years since the storm, his parents and his wife have died. He has struggled immensely and is anxious to return home. When we got to the site on Monday, the inside of the house was just a wooden frame. By the end of the week, it was almost completely dry-walled. I couldn't believe how hard the Sisters worked, some of them in their 70's! That spirit of a shared commitment to the Gospel we spoke of tonight at our young nun gathering was alive in New Orleans! We started each morning with prayer together. During the day, we faithfully employed tape measures and box cutters and drills. Everybody wanted to be there to serve and did so (for the most part) with simple joy (there were only a few choice words uttered when the screw wouldn't go in, or the measurement was off, or the drywall broke...). In the evenings, we ate together at the house or went on various outings. We often ended the night playing goofy party games and laughing more than I have in a long time. Many of the Sisters from different SC congregations had never met before, but there was a natural bond and quickly developing feeling of family. I would not have traded my spot in that group of women for anything. Now, I would be painting a false picture if I told you that being a Sister makes me feel this sense of contentment and pride I just described each and every moment. Day to day religious life is not glamorous or romantic. It's life - sometimes really good, sometimes so-so, and sometimes really difficult. In fact, the first five months of Novitiate have been especially difficult. I haven't written much about it because it feels too personal and too much in process still to put it into words. But encounters like Nuns Build and tonight's get-together have given me a much needed shot of energy. Maybe it's like when a couple finally gets to step out of their routine and go out for a nice dinner after running on auto-pilot for a few weeks. They dress up and check out a new Italian place. Maybe they laugh about stories from when they first met, dream about what the future might hold, and simply enjoy each other's presence in the present with intentionality and few distractions. I feel that similar candlelit dinner glow in my heart when Sisters gather. It puts me in touch with why I so passionately want to be here and why I could not not say yes to this path. In our prayer tonight at the Motherhouse, we used the Gospel reading about "The Visitation," Mary's visit to her cousin Elizabeth who is pregnant with John the Baptist as she is pregnant with Jesus (Luke 1:39-45). It's such a joyful encounter of two women rejoicing in the new life growing in each other. As Sisters, we obviously don't relate directly to the sensation of an infant "leaping in the womb" as Elizabeth's did upon Mary's greeting. But we are Christ-bearers and bringers of new life in many different ways, and something certainly leaps inside of us when we come together, embrace, and celebrate our unique and treasured vocation. As we "speed-dated," prayed, ate, and laughed at our religious Fishbowl answers this evening, it struck me that the Motherhouse, our gathering space, dates back to the 1880's. How many Sisters have gathered in that very room over the last 130 years? Our energy seemed to brighten up the wise and quiet halls of the historic building, like we are somehow the new life leaping for joy in the womb of religious life. I am grateful for the beautiful web of women religious that reaches into history, spans the globe, and leans into the future with faith and promise. We're in this together, Sistas. ...Except if you're on the other team in Fishbowl. Total writer's block over here. I've tried to blog for the whole month of October. I keep starting and stopping entries. It seems that I'm still figuring out how to put the experience of Novitiate into words. 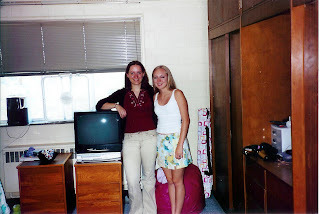 In the meantime, I interviewed my dear friend and former college roommate, Kaitlin (Moredock) DiNapoli, about what it's been like to have a peer and close friend become a Sister. Kaitlin is a native of Springfield, IL, and a fellow graduate of the University of Dayton. 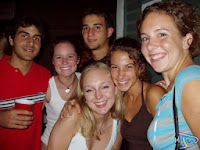 We met the summer before freshman year at an orientation and instantly clicked. 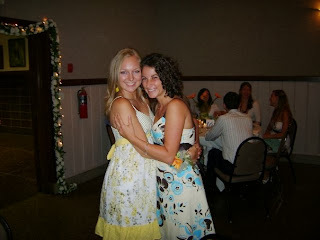 We lived on the same dorm floor the first year and then were immediate roommates for sophomore through senior years. After college, she went to Notre Dame where she got her law degree and met a wonderful man named Jason. 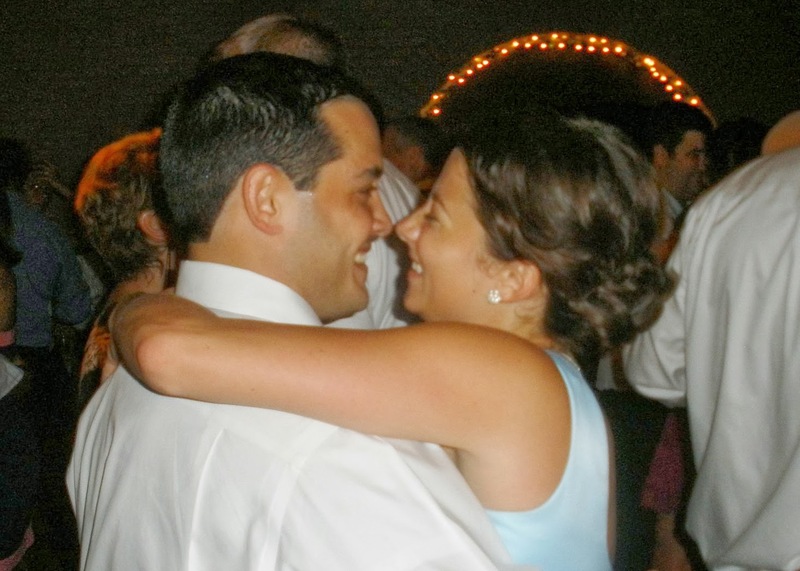 They married in April in Philadelphia, where they currently reside and practice law. And...they are expecting a little one in the spring!!!! Despite the physical distance between us the last few years, we've remained an integral part of each other's lives. I'm especially grateful for her support and enthusiasm for my chosen life path, and it's been a joy to watch hers unfold. Tracy: Alright, Kait, to start off, what would you like to say about how we met? 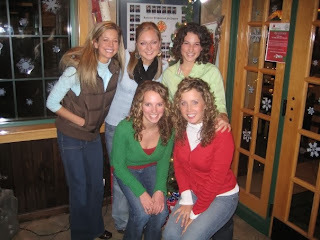 Kaitlin: I just like that we met even before freshman year of college, 9 years ago, and we knew automatically that we were going to be best friends. (I laugh) No, seriously, it was so easy! We’re both so different now from who we were then, but it’s still just as easy. T: When you think about our time as roommates together at UD, what comes to mind for you? K: For me, it’s just happy; a time where we were trying to figure out what we would do and where our talents were best used, but we were always really involved, and busy…and happy. T: That’s exactly the word that came to mind for me too when I pictured our room! Always lots of laughing. K: Right, and it was just uncomplicated, but not unquestioning. So, I pulled off…um…our mission statement (I laugh loudly. Yes, Kaitlin and I actually wrote a mission statement and hung it in our bedroom senior year. I know…). Listen to it! (I’m still giggling) Listen to it. K: Doesn’t that just say it? T: That makes me really proud of us actually, because I think sometimes it’s easy to focus on things about college life that I’m not so proud of. K: Of course. It’s easy to think back on the scenes at Tim’s or Milano’s (favorite UD bars) where it’s 4 in the morning…wait a minute, never mind…it was never 4 in the morning for us. (We both laugh) It was 2 in the morning (laughs), and we’d be out all night, at several different parties…yea. But that sense of mission has always been central to who we are. T: When those 4 years were coming to a close, what did you think that my future might look like? K: Well, I knew at the time you were going to Ecuador to serve for at least one year, and I thought was good for you and in line with your wanting to live a life of service. But I thought that afterward, you would find a good non-profit to work for. I still pictured you on the border [at El Paso, Texas, and Ciudad Juarez, Mexico]. 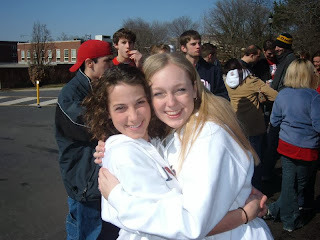 (Kaitlin and I went on an immersion trip there together as sophomores. 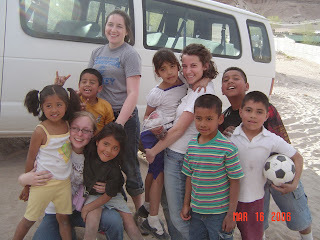 I did end up living for 3 years with the Sisters of Charity). And…I thought you’d be married. Not necessarily with one of the guys you dated in college…I’m not sure. I don’t know about kids, ‘cause it was still too early for me to think about. But, I pictured you with a husband. I mean, that was the norm. And you’d been in a lot of relationships; a lot of steady relationships. T: Yea. (We both laugh) That’s similar to what I thought, too. That I would end up married and working for a non-profit somewhere or in campus ministry. K: Yea. I didn’t see you going to law school even though you took the LSAT. Just because it would’ve been too removed from “the people” for you. T: So, do you remember the first time I told you I was thinking about being a nun? K: It would’ve been the Fall of 2009, right? T: Well, 2008. It was the Fall after we graduated. We were chatting online because I was in Ecuador. K: Right, right. Okay. Honestly, I remember being not too stunned by the news. The way you explained it to me, it wasn’t like you were sure about it. So my whole outlook on your life didn’t change instantly. It felt like – okay, this is something we’ll think and pray about. Oh, and the timing made sense. You were in a place where you were doing so much reflection. I remember being jealous of all the time you had to pray. I had already thought, “Wow, look what she’s coming to! I wonder what the future holds?” So, it wasn’t difficult to understand. T: I remember feeling support from you right away. You were one of the first people I told, I think right after my Mom. I knew it wouldn’t be totally off the wall for you because of our faith background. But you were so very receptive, which was nice. Because I think for me it felt like “coming out” in a certain way, like sharing a deep secret. K: Yes! When I was reflecting, that was a comparison that came up for me. It was kind of like you were “coming out.” But I will say that still, it really wasn’t as surprising to me as maybe you thought it would be. T: So, from that day on you’ve been walking with me on this journey. What’s it been like for you? Other things had been clearer, like when you described living in the Affiliate house as “dating the idea of becoming a nun.” That was very relatable for me! If you’re dating someone, you’re just seeing if it fits and if it’s where you’re called to be. That was easy to understand and support. But in this one, I couldn’t help you much, because it was a foreign experience. That was very difficult. At the same time, other things have been uplifting and wonderful, like seeing you at the Motherhouse among all these Sisters who place so much hope and trust in you. It made me so proud! Trace, so much of your journey has led me to immense pride in you. That’s why I tell everybody that my best friend is going to be a nun. Cause I’m really proud that you are! Okay, moving on…is there anything you’ve learned that has surprised you about religious life? K: Yes! 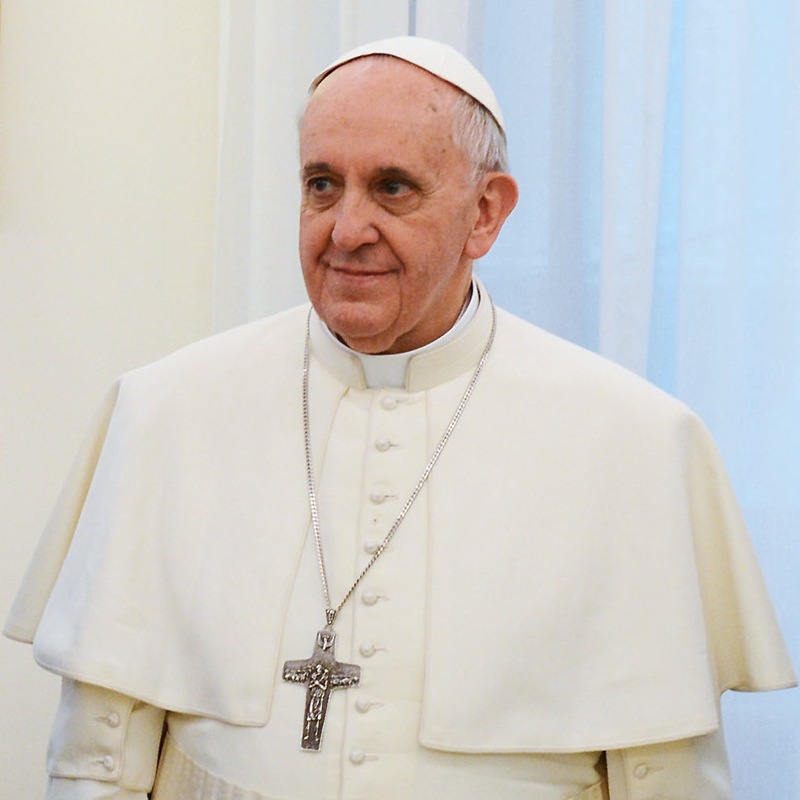 I’ve learned a lot about different ideologies within the Catholic Church…well, particularly in the U.S. As Catholics, we all adhere to the faith, but then there are these branches, like more liberal Catholicism that emphasizes Catholic Social Teaching and liberation theology. It became evident in the tension around the Church’s investigation of the U.S. Catholic Sisters. I paid so much more attention to that whole thing because I knew that you were joining the ranks. And it’s driven me to have more conversations about things like that than I would otherwise. Oh! I also learned in one of our recent conversations that Sisters and Brothers are considered part of the laity because they’re not ordained. I never knew that before! T: Was there anything that you learned during your visit here to the Novitiate House and Mother House? K: Yes, that’s why I’m glad I visited. I understand your life there much better now. One thing I come away with is that you’re under more pressure than I was sensing. When I was there, I felt pressure to get to know the many older Sisters and their stories – because they’re remarkable! These women have done remarkable things for our Church and our world. And within the next couple decades, many of them will be gone. I see how you want to know these stories. They inspire you and help you to know how to live out your...hmm…I think of it as a call within a call. You know, there’s Sr. Kateri working with the veterans and doing amazing things on their behalf…and Sr. Flo, going to a remote village in Peru and being pretty much the only face of the official Church there. There are many stories to hear, and big shoes to fill, and that can be daunting! K: Yea, and I just imagine that might be stressful in a way. I also see what a gift this year is for you. You get to learn from everyone around you as well as really focus on your own spirituality and relationship with God. T: It is definitely a great gift! Speaking of gifts, let’s talk for a minute about our friendship. Has my choosing this path brought any specific challenges or gifts to our relationship? different paths, we have to communicate our lives better to each other to maintain this level of understanding. For example, when Jason and I found out that we were going to have a baby, we told our parents and our siblings first. Then I talked with Jason and told him that I wanted to tell you before we told anybody else, because…I don’t know…it felt right to include you in that part of my life. Because you’re called to be a Sister, I feel like I should be very open to you about my life and my marriage so we don’t drift apart. I have to tell you because you won’t be able to say, “Oh yea, my husband I went through that, too.” And I think you’ve been doing the same thing with me. That’s what I saw when I came to visit you. There’s openness about your life and your calling and what you’re doing every day. T: Yes! It’s enriching to both be fully embracing our different vocations and sharing about it. I feel blessed to have such an understanding of what the beginnings of marriage and starting a family can be like through your eyes, since I’ll never have that experience personally. I treasure that. K: I do, too. And I also like that I’m able to share about you with other people. It starts so many rewarding conversations, with friends that are Catholic, or Jewish, or any other faith, or those that don’t identify with any faith tradition. T: One challenge to our friendship that I reflected on has been my absence at gatherings of friends in the last few years. I know I talked with you about this internal struggle last spring when you had your bachelorette party in Philly. I just couldn’t be present for things as much as I’ve wanted to in the last few years. K: Oh, yes! I’m so glad you brought that up. Yea, you can’t and won’t be able to travel as much. Some of that isn’t specific to your calling to be a Sister. There are lots of other situations that keep people from traveling a ton to be with friends whenever they want, too. But it’s different because as a Sister you’re living in community. You can’t just decide to get in the car and leave and drive and crash at a friend’s house for a night on the fly. You’re committed to that group of people in your home. T: Yes, definitely. And I know that I’ll often have to make choices like that based on my commitment to community and ministry as well as due to our sharing of financial resources. I know that these kinds of changes come with any sort of commitment. I know that your dinner time with Jason is sacred. You don’t spend your evenings on the phone because you want to be present with him. And once you start a family, it’ll be more difficult for you to just go on a girls’ weekend or something. I think maybe it just hit me the last few years because the twenties are often a time of relatively more freedom. And I just couldn’t be there for all of the get-togethers and celebrations. K: Your friends understand, though. Everybody has been put in situations when they can’t be everywhere they want to be. And, your friends know that you’re doing something really special and really different. Nobody’s holding any grudges. T: Going along with that, do you have any words of wisdom for friends or family of someone discerning a religious vocation, or any life choice that might be considered unexpected or unique? K: My words of wisdom are just to keep an open mind. The person who is discerning is trying as hard as they can to figure out where they’re meant to be. Saying things like, “Maybe you just haven’t met the right guy yet!” is not ever going to help (laughs). It kind of breaks my heart when I hear people…well, normally it’s single men in their mid-twenties who think you’re very attractive (we laugh) and they’ll say to me things like, “She’s so beautiful, she’s so talented, she’s so funny…WHY is she doing this? Maybe she just hasn’t met the right guy yet.” But the thing is, it’s NOT a last resort. I know the kind of heartache that you went through. You were probably looking at every other possibility before you could give yourself to this path (we laugh again because it’s true). Adding pressure won’t help. Just try to be supportive and more open with your friend about your life, too. T: Beautiful. Finally – considering the future, as we both live out our God-given vocations, what do you look forward to in our friendship? K: I can’t wait. I’m so excited! I can’t help but smile. First of all, our little babe having an Aunt Tracy who’s a nun (we giggle). It’s going to be so special. And then, thinking about…well, this is a perspective I have after going to the Novitiate House. I see all the amazing things that these women have done, and I wonder: what is it going to be for you? How are you going to live this out? How are you going to change the world? The possibilities are ENDLESS. It’s exciting, and it’s something that’s going evolve throughout our lives. And, I get to be there! I get to be your best friend still. (laughs) It just makes me happy, Trace. Sister Donna Steffen, Andrea’s and my new Novice Director, offered us these words as part of her homily during our Novitiate Opening Ceremony on June 26th. The special moment happened on the first day of the Gathering, an event that occurs every four summers. 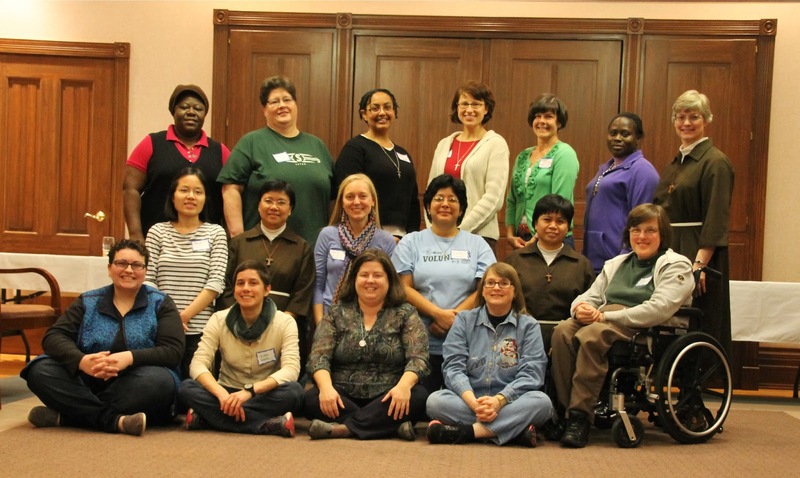 All of the Sisters of Charity and Associates that are able come together at the Cincinnati Motherhouse for a week of fellowship, prayer, learning, and fun. The ceremony marked for us the beginning of Canonical Novitiate, the next step on the journey to becoming a vowed Sister of Charity. This is a sacred time that every person who wishes to become a Sister or Brother will experience, as directed by canon law (from the Vatican). The program varies depending on congregation, but the idea is the same: a year “set apart” with a focus on prayer and solitude and going ever deeper into one’s relationship with God. And so, Donna invited us “fall in love” totally and absolutely as we consider giving ourselves and our lives as Sisters of Charity. What an honor it was to stand on the altar where so many Sisters have walked before as we made our commitment to the Novitiate. 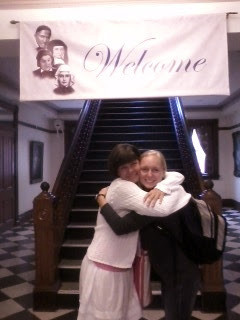 The Motherhouse chapel is alive with their spirit – the spirit of women who are and were deeply in Love with God. Love is what has seized their imagination; Love gets them out of bed in the morning. When we stood up to face the Sisters and Associates and our family and friends, I just plain bawled from all of the Love that was filling that Chapel clear up to the ceiling. The President of our community, S. Joan Cook, introduced us to the community as “Sister Andrea Koverman” and “Sister Tracy Kemme.” S. Lois Jean Goettke, a member of the Leadership Council, adorned each of our dresses with our official SC pin. I cried again, amazed with joy and gratitude. I wish all of you could have felt the undeniable presence of Love that was just as real as the air we were breathing. As we processed out of the ceremony – Joan, Lois, Donna, Andrea, myself, and S. Janet, who was our Affiliate Director – it was like walking on air. Andrea and I couldn’t keep the smiles from bursting off of our cheeks, and when we reached the back of the chapel, we leapt with joy and hugged everybody in sight. Two weeks into Novitiate, the transition is still fresh for me. Newness is always good and tough at the same time. But, I have a sneaking suspicion that I’m already a tad bit in Love, and that makes everything worth it. During this year, we’ll have three days a week of study, a day of volunteer ministry, and one day designated as “Sabbath Day.” During our free time, we’ll be fully involved in our house community with Sisters Carol, Maureen, Nancy, and Terry, and with the wider congregation that surrounds us here in Cincinnati. And of course, Andrea and I will be opening our hearts wider to God, hoping to find God and knowing that God will certainly find us. Some might see the choice we’ve just made as crazy or incomprehensible. 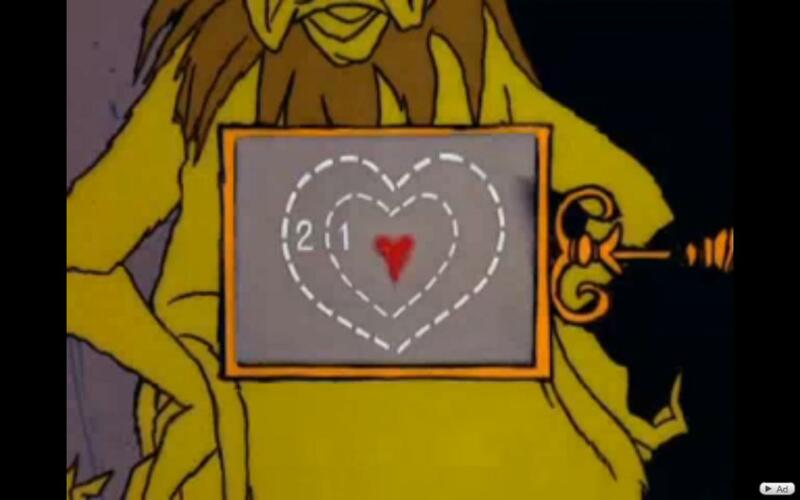 But, really, it’s all about love, and what could be more practical? last week. Picture courtesy of Romina! I sat down in the chapel late last night when the house was quiet. I couldn’t let the day be over just yet, knowing that the morning would bring leaving. I opened my journal and wrote a heading for an entry: “Last Night as an Affiliate in Casa Caridad – June 11, 2013 – 11:30pm.” I sighed and looked around, wondering how many hours I had spent cross-legged on that little floor pillow, in prayer with my community and our loving God. Just before I began to write, I remembered that each page of my journal contains a different Bible verse. I glanced to the bottom of this so-far empty sheet to see today's nugget of wisdom. I smiled through my tears. Okay, I hear You, God, I thought. You’ve got this. I’d been feeling as ready as I could feel for the move from El Paso back to Cincinnati. Then last Tuesday, I had my small obligatory pre-transition freak out as I spent probably seven hours straight going through belongings and packing. That physical act always gets my anxiety going. Suddenly, my somewhat settled life was becoming fragmented into a bunch of suitcases. I realized that soon my room wouldn’t be my room anymore. The trust I felt before was MIA. 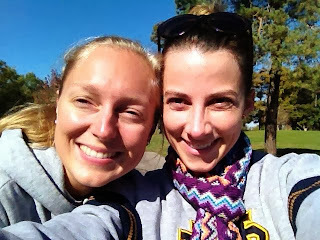 On Wednesday morning after my frazzled afternoon and evening of packing, I met with my spiritual director, Veronica. Sensing my unsettled heart, she looked me in the eyes and told me, “The Paschal Mystery is at the center of who we are as Christians. And you, you’re living it right now. “Transition involves a lot of letting go. Well, really, this whole time of discernment has involved a lot of letting go. You’ve had to die to ideas of yourself and your life that will no longer come true. You’ve had to let go of control, of knowing where and how God will you use you, of the security of a romantic partner, and many other things. Now you’re letting go of “Affiliate Tracy” or “El Paso Tracy.” Like death, this letting go hurts. But we know that death is not the last word. All of this death has made room for new life. And it’s all been happening simultaneously. Tracy, things are RISING in and for you!” she said. She’s right. In this moment, there’s mourning happening, but there is much treasuring and rejoicing and looking forward to. In prayer last night, I scanned the many faces that represent people I have loved and have loved me in my almost three years at the border. On a walk with Janet and Romina this morning, I tried to soak in the big Southwest sky, the sounds of the birds, the beauty of the pecan groves and this year’s cotton crop just sprouting up. As we drove along I-10 to the airport, I tried to swallow up the Franklin Mountains, Mt. Cristo Rey, and the view of the tiny houses of Mexico just beyond the border fence. In the same instant, I imagined that beautiful red brick building overlooking the Ohio River that the Sisters of Charity of Cincinnati call home. I imagined all of the hellos that would follow these stinging goodbyes. I felt the warmth that comes from spending some time in Fairfield with my beloved Mom and Dad who I never get to see quite enough. As our plane landed in Cincinnati tonight, I celebrated the lush green Midwest terrain and rivers that stretched out before my eyes. Leaving – somewhere, or something, or someone – always seems to show me the expansiveness of the human heart. In saying good-bye, we behold all of the gifts of the phase that is ending and open ever-wider to all of the gifts that will come. We cry because we have loved deeply. We hope and rejoice because we will love deeply. How is it possible that our hearts are able to contain so much at once? As I shared teary-eyed hugs with loved ones before heading through security at the El Paso airport today, I felt it all. There was love, joy, pain, fear, excitement, gratitude, memories, faces, places, moments, feelings, hopes, dreams, and more love. 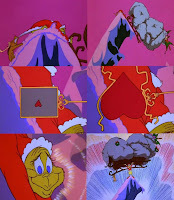 A bit like in The Grinch Who Stole Christmas, my heart swelled and throbbed and maybe even grew. As Romina said today, our lives are so full! These moments help me to stand in awe at the fullness of my life. And at the infinite nature of God's love. Tonight, Mom and Dad picked me up and brought me back to Fairfield, Ohio. I ate delicious leftovers from the dinner Mom cooked last night. We watched some episodes of Seinfeld. Dad and I each had one of his home-brewed beers. Now, sitting in my childhood bedroom, I'm surrounded by pictures and trinkets from my grade school and high school days. 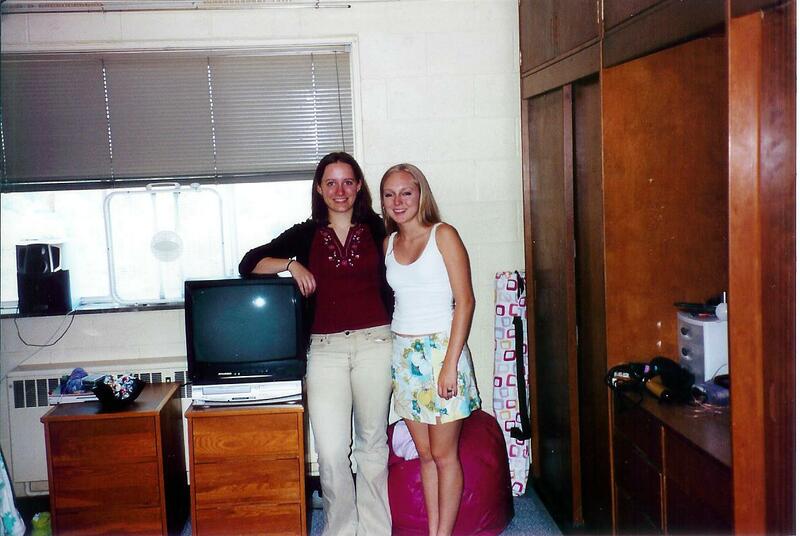 I feel so far removed from the younger Tracy that this room represents, but I’m not separate from it. It is all a part of me, just as these three years in El Paso are ingrained in my soul and will be with me wherever I go. God is watching over us now and forever – our coming, our going, our staying, our starting, our seeking.